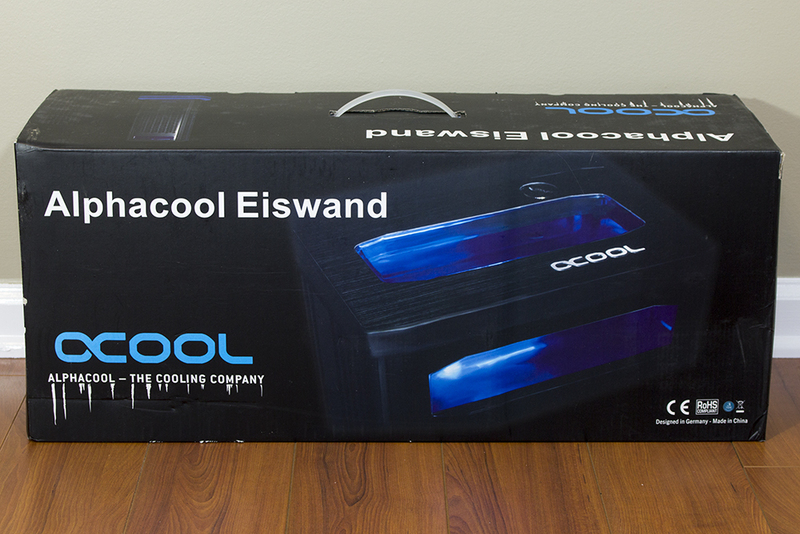 Today from Alphacool we get the chance to look at a very new product to the market, the Eiswand. This is a standalone watercooling kit with everything you need to get started! This kit is even friendly to those with small factor cases, as the radiator/pump/reservoir are all external and contained in one housing. Enough banter, let’s dig in and take a look at this kit! As with everything Alphacool makes, all the watercooling components are made of copper/brass. The radiator used here is their NexXxoS XT45 360mm, which is 100% copper construction and very well known on the market. The water block in use is the NexXxoS XP³ Light which has a copper base plate and black acetal top. Tubing, fittings, quick disconnects, and fluid are all supplied as part of this kit as well. For the rotating components: dual low noise pumps and six fans are in use. The dual pumps are for redundancy in the system, these run at 2600 RPM for quiet operation. The fans are the Alphacool Eiswind, running at either 1100 RPM (12 V) or at 700 RPM (7 V), and utilize sleeve bearings. 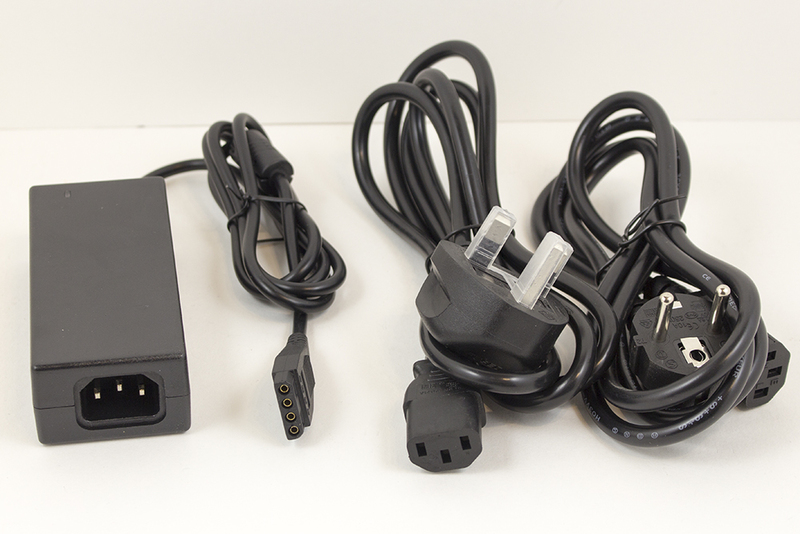 These can be powered either via Molex from your PC or from the included power supply. 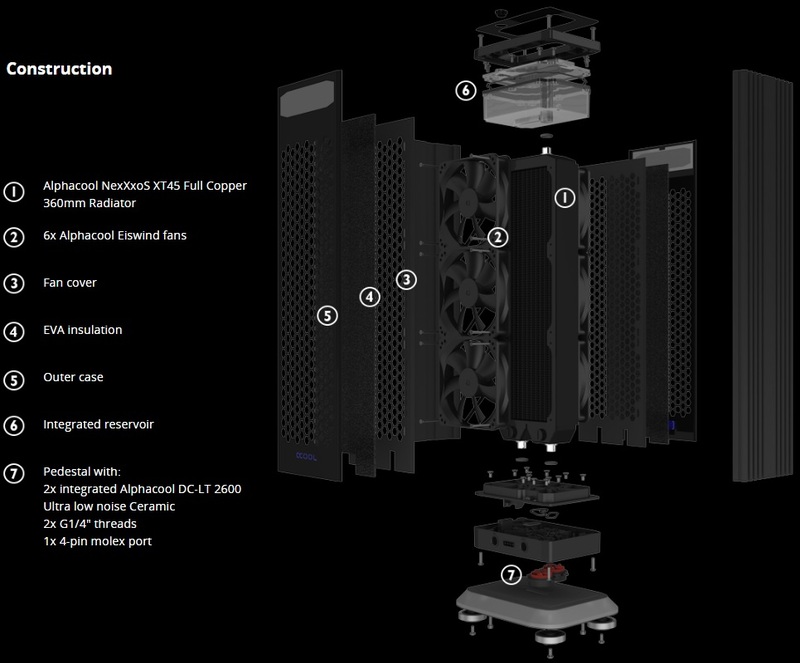 All specifications in the table below come from the Alphacool website. The dual pumps mentioned above are also a huge feature for the Eiswand, as they allow you to add additional components such as another radiator or a GPU block. The Eiswand case is illuminated in multiple spots, including the reservoir. The fluid level is easily seen through the large window at the top of the case. Adding a block, or other components is as easy as can be thanks to the quick disconnects included with the kit. This also makes it easy to move around the PC the cooler is attached to, as you can put the quick disconnects between the PC and the Eiswand. These are also the same disconnects used by Alphacool’s pre-filled blocks. 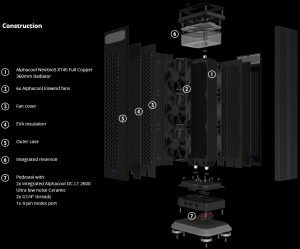 All the features below were provided on the Alphacool website. The Alphacool Eiswand is an external radiator with an integrated reservoir and two pumps. It is shipped with all the parts you need to cool your CPU and expand your cooling loop with additional products. The Eiswand is Alphacool’s complete water cooling set for your CPU. 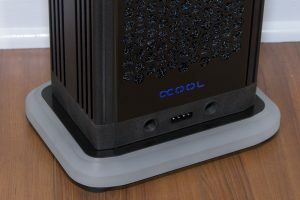 Thanks to the included quick-release connectors, it’s easy to connect additional components to the loop, such as the Eiswolf, Alphacool’s pre-filled graphics card cooler, or an additional radiator. 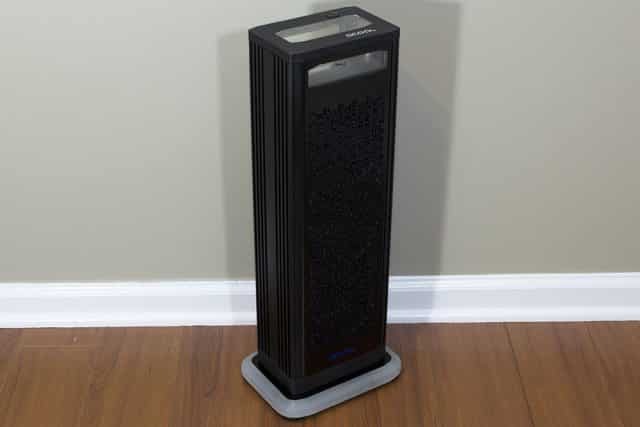 The core component of the Eiswand is the external 360mm full-copper radiator, which is equipped with six Eiswind fans. This means the system’s cooling power is high enough for any combination of CPU and GPU. The illuminated reservoir sits directly on the external radiator. The fill level can easily be seen through the large viewing window, and a fill port on the upper surface makes filling the system easy. 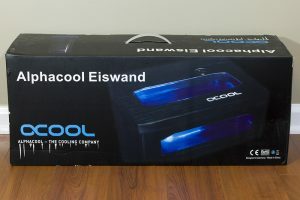 The elegant, likewise illuminated bottom of the Eiswand contains two DC-LT silent pumps, which are also used in several of Alphacool’s other systems. The pumps’ capacity is so high that even if one of them fails, there is no noticeable loss of cooling power. This puts you on the safe side in any situation. The included XP³ cooler is among the strongest coolers on the market and is compatible with all Intel and AMD sockets. 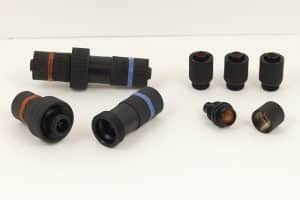 Of course, the set also includes all the other necessary parts, such as a hose, connectors, and coolant. Thanks to the quick release connectors, the Alphacool Eiswand can be expanded easily with other components. For example, the Alphacool GPX-Pro, which is shipped with matching connectors. Of course, you can also find identical quick-release fasteners in our assortment. Huge. The retail packaging is huge. That said, there’s a lot stuffed into the box by Alphacool here! The handle on top is much appreciated, as it is also quite heavy. 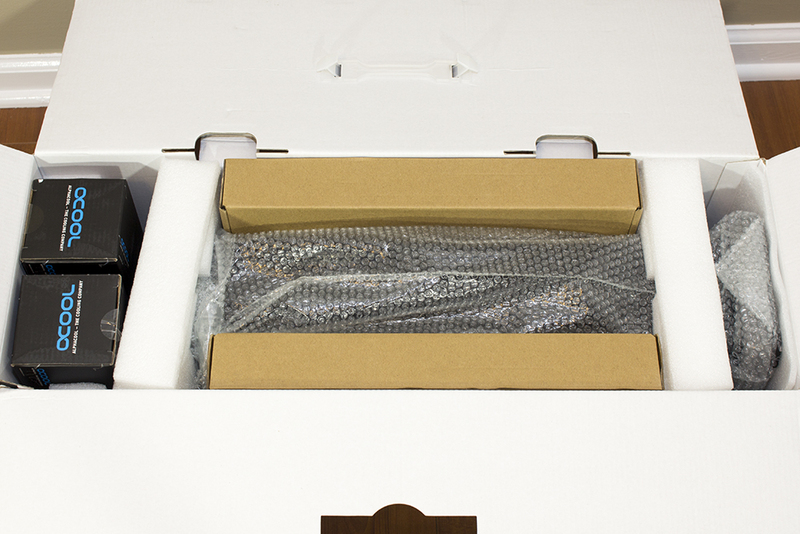 Opening up the box we see the Eiswand kit and all accessories safely nestled inside. The brown cardboard boxes hold the block/accessories/etc and the two black boxes on the left have the fluid inside. In the bubble wrap is the radiator/stand itself. 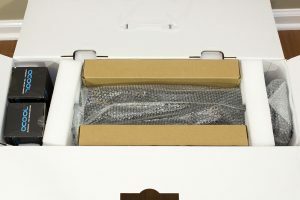 The base of the Eiswand is very smartly the part pointed toward the outside of the packaging. Here is the Eiswand itself, standing in at almost two feet tall it is no small piece, but the entire casing exudes a great build quality. 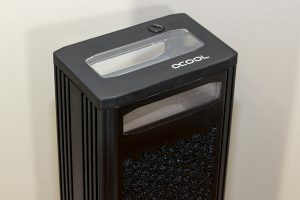 In this tower are a 3.120 radiator which is 45 mm thick, six 120 mm fans running at a max of 1100 RPM, a reservoir, dual water pumps, and water/power connections. This should be enough radiator for most any single CPU/GPU combo arrangement, it’s definitely built for expansion. This is a close-up of the reservoir sitting at the top of the unit. Only one port here, the fill port. Here’s the back side of the base of the Eiswand. This is where you connect the in and out water connections as well as a 4-pin Molex to power the pumps, fans, and lights. The pumps are plenty strong enough to add a GPU block to the loop. And now a pair of pictures of the unit powered and lit up. It is an incredibly quiet setup, I cannot hear it over my other system fans at idle (which are PWM controlled Noctua). Note: I removed the EVA insulation on the intake side of the Eiswand due to it making a ticking noise against the fans. The exhaust side is absolutely fine though. Now up are a couple of pictures of the included XP³ water block, this includes mounting for many systems. Namely 115X, 2011, and AM3+. There is an AM4 bracket available as well, which is pictured here on the left. The included tubing and fluid are more than enough to get you going. During my filling, I used about three-quarters of one of the one-liter bottles. 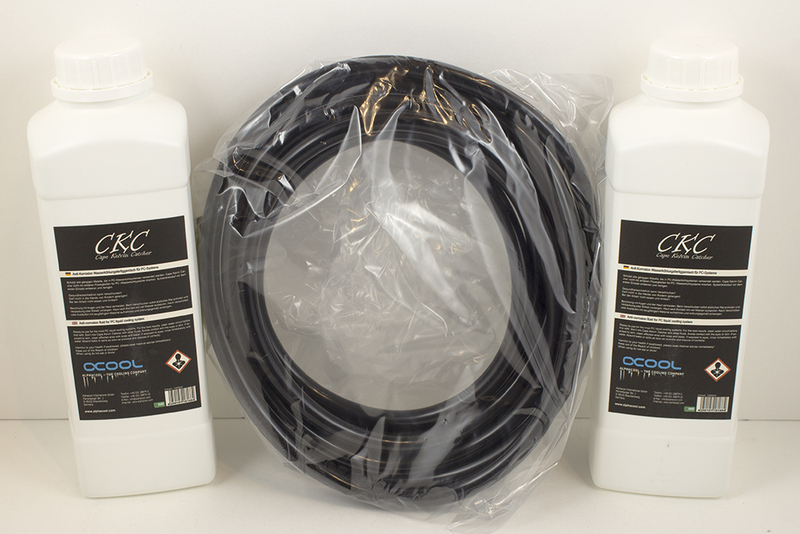 There are 4 meters of the 11/8 mm tubing included here, it is a black PVC tubing. Even if you’re planning to put your Eiswand on the floor beside your desk, with the PC tower on the desk, you won’t need extra tubing. I do wish the tubing was a bit more common size, but Alphacool sells everything you need for the 11/8 mm diameter fittings/tubing. Next up are the tubing anti-kink coils, Molex power cable extension, and Molex 12 V to 7.5 V adapter. Using the voltage adapter reduces the speed of both the pumps and fans, but I honestly think at 12 V this combo is plenty quiet for anyone. The anti-kink coils allow tight bends without worry of collapsing the tubing, they are 30 cm long and four are included. The Molex extension is about 3 feet long, plenty enough to get back to your tower from the power connections. 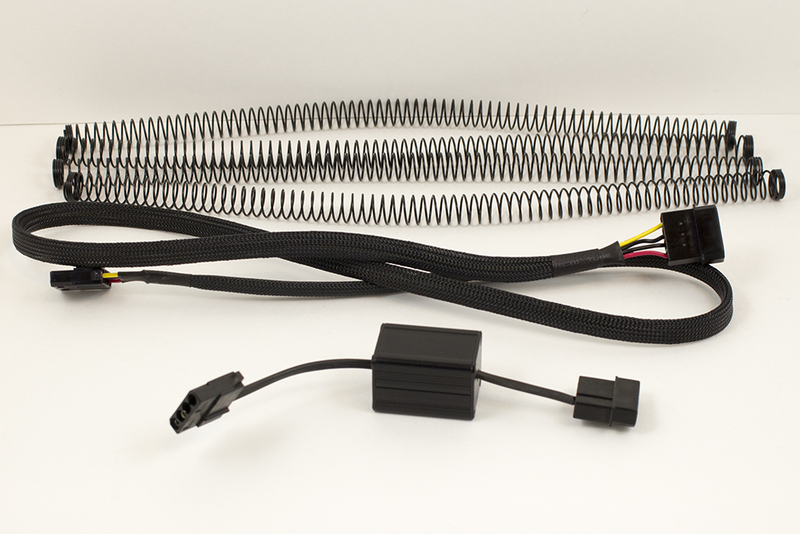 I would recommend running the Eiswand off of your system’s power supply so it will turn on/off with the rest of your PC, the Molex extension makes it easy to do so. The quick disconnects and fittings included are all you need to get started with the Eiswand. Four brass G1/4 fittings are included to use with the kit and the XP³ block. Two quick disconnects, which also function as bulkhead connectors, allow ease of connection to your computer tower. My only gripe here is that the quick disconnects are plastic instead of brass, but they are definitely of high quality. Lastly, the external power supply. Unfortunately, it only includes Euro/UK plugs, but the power brick accepts a standard PC power cable. For all blocks used here, the radiator/pumps/fans did not change, with the exception of the Glacer 240L as it is an AIO unit. The NexXxoS XP³ Light numbers represent the Eiswand kit as it comes from Alphacool. The Eisblock XPX is another block they sell, which will be seen in its own upcoming review. We see good performance in all three stress tests. The 7700K is not an easy processor to keep cool when overclocked to high levels due to the TIM under the IHS, but the Eiswand kit fares very well. As above, for both blocks used here, the radiator/pumps/fans did not change. 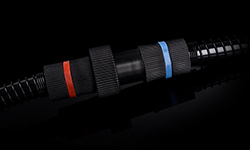 The NexXxoS XP³ Light numbers represent the Eiswand kit as it comes from Alphacool. 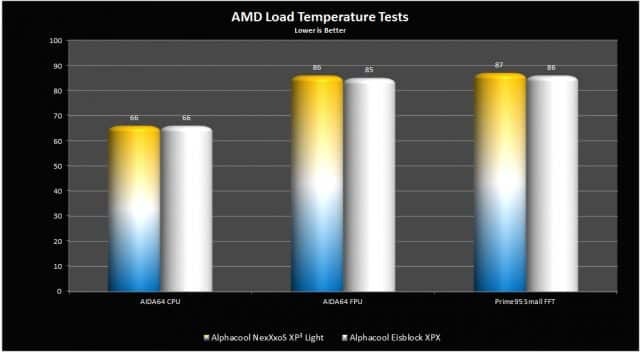 The Eisblock XPX is another block they sell, which will be seen in its own upcoming review. Keeping the Ryzen 7 1800X cool while overclocked at the limit isn’t a small task, but we see very good performance out of the water kit here once again. With the Alphacool Eiswand, you get a custom watercooling kit with no case fitment dependencies. Setup is incredibly easy compared to most watercooling kits and, to me, bridges the gap between full custom watercooling and an AIO unit for many users. Performance of the included block is on par with many other blocks on the market, both in my testing and others, so you aren’t losing performance from a low-tier block here. The pumps, remember the plural here, and fans are near-silent and easily blend into a room’s natural white noise. Pricing of the cooler as of this writing is $378.14, on the Aquatuning/Alphacool US Webstore. In comparison to other watercooling kits, this is a good price. For a quality 360mm kit, you’re typically spending a minimum of $250, but that’s still a single pump and half the fans. 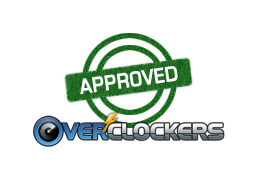 Overclockers approved. nice, reminds me of the old zalman reserator. i think having the quick disconnects to use for upgrading is a long time coming. i dont know why more companies havent tried to go this route sooner? 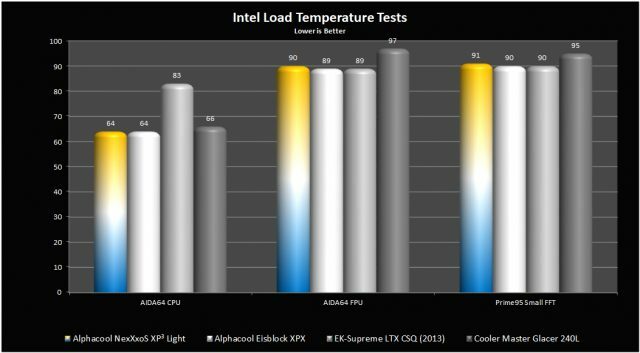 Interesting to see if someone is willing to daisy chain multiple AlphaCool Eiswands...can it be done? I'm quite sure it can be done without issue. Not sure why you would need to with the dual pumps and amount of radiator though.